I always enjoy when experts from two different fields come together to ask questions and seek solutions to problems no one else has approached in quite the same fashion. Such is true with the partnership between Tony Wagner, an Expert in Residence at Harvard University’s Innovation Lab and leader in education has teamed up with Ted Dintersmith, one of the world’s leading venture capitalists and entrepreneurs with the goal of radically changing education in America. 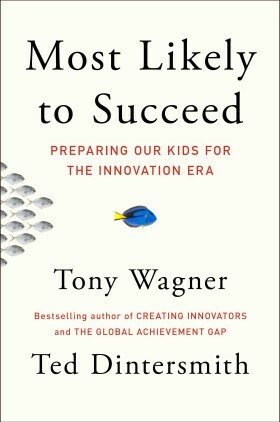 Their book, Most Likely to Succeed: Preparing Our Kids for the Innovation Era, is excellent. Today’s schools prepare kids to pass exams and learn basic academic information, yet they are lacking in the core competencies that will be required of them in the real world. I see this more and more in our hiring days and through conversations with clients who also express frustration that younger applicants lack basic communication skills, a strong desire for success and overarching weak curiosity about anything in particular in the universe. Most applicants, when asked what they are “really, really good at” don’t have an answer. Although I do not agree with all of their proposals nor how these initiatives might be funded; we’ve often forgotten that many of these problems are behavioral problems on the part of the parent, student or both; I do agree with the questions they are asking and their desire to seek solutions that we might not know exist just yet. If you have a student living under your roof, a teacher in your family, politician who wants to actually see change happen and not just talk about it, this book, based on the overwhelming scarcity of really good texts on the topic, appears to be required reading. Don’t miss the business lessons scattered throughout on affecting change, driving leadership around core values and pushing ahead in areas often thought unchangeable or impossible to improve. This book applies well to your practice if you look at the case studies and ask yourself how you can apply the principles presented. Of particular note for you and your practice are Pages 78-83 and Chapter 6.